Fourth-quarter results and 2017 guidance from the big four oil-field service companies—Schlumberger (NYSE: SLB), Halliburton (NYSE: BHI), Baker Hughes (NYSE: BHI) and Weatherford International (NYSE: WFT)—highlighted recovering drilling and completion activity in the US onshore market and ongoing challenges in international markets. 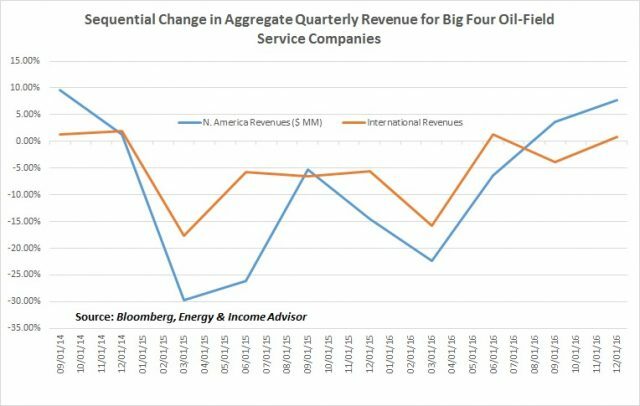 In aggregate, the four largest oil-field service firms’ North American revenue began to improve on a sequential basis in the third quarter of last year. This increase accelerated to 7.75 percent in the final three months of the year. Year-over-year improvements, however, have remained elusive. Once again, the prospect of increased upstream capital expenditures appears most robust in prolific US shale oil and gas fields, where exploration and production companies have taken advantage of the recovery in oil prices to hedge future output and ramp up spending. The Permian Basin in West Texas may be the hottest area in terms of drilling activity, asset acquisitions and media coverage. That said, the recovery in the US rig count looks broader that one might expect, with the formerly out-of-favor Eagle Ford Shale and the Haynesville Shale posting surprisingly impressive gains. In contrast, international capital expenditures are expected to remain flat to slightly down in 2017, with the Middle East and Russia regarded two markets with any upside. Although we struggle to identify a compelling reason to buy any of the big four at current valuations, recent weakness in the energy sector—and questions from readers—have prompted us to delve into names that offer concentrated exposure to the US onshore market. Industry survivors with superior scale and balance sheets may have an opportunity to take market share from smaller operators. Oil-field service companies have also slashed costs aggressively, providing earnings leverage to a recovery in volumes. We continue to expect short-cycle US shale plays to take market share in coming years, as underinvestment in deepwater plays and other complex developments manifests itself in the international decline rate. Chevron Corp (NYSE: CVX) and Exxon Mobil Corp’s (NYSE: XOM) plans to allocate a growing portion of their budgets to US shale development underscore this point. However, the relatively rapid recovery in US oil output since its nadir in summer 2016 raises questions about the industry’s ability to obey this speed limit and the potential consequences for energy prices—which, ultimately, will dictate overall activity levels. US shale oil and gas producers have made significant progress on improving operational efficiency and productivity by focusing on their core acreage, embracing pad drilling, loading more proppant, increasing the density of fracturing stages and sinking longer laterals that target the reservoir rocks’ most productive zones. These efforts have lowered the oil-price realizations that the US shale complex needs to grow its crude output to between $50 and $55 per barrel. Ongoing investment in automation and other process improvements as well as incremental productivity gains could move the so-called shale price band incrementally lower, while corporate tax breaks could also lend a helping hand. And investors shouldn’t overlook the progress being made to reduce break-evens on deepwater developments by taking advantage of excess service and equipment capacity and focusing on opportunities to tie-backs that involve existing infrastructure. Industry consolidation will also improve standardization and integration on these complex projects. Our formerly out-of-consensus view that US oil production would surprise to the upside in 2017 and offset OPEC’s production appears to be gaining credence. Weekly data from the Energy Information Administration indicate that domestic crude output has increased by 660,000 barrels per day since last summer. The recovery in US oil output, coupled with persistently high inventories in North America, once again present OPEC with the challenge of choosing between ceding market share or cutting supply to reduce global stockpiles and move the market closer to balance. A decision to preserve market share could send oil prices tumbling and inhibit drilling and completion activity in US shale plays—a negative for oil-field services outfits. Conversely, a move to support oil prices would encourage stepped-up development of US conventional oil and gas fields. 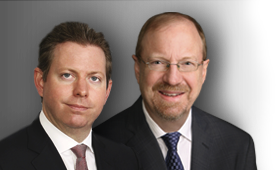 In light of this macro backdrop and prevailing valuations, we prefer the above-average yields and volumetric growth stories available in the midstream segment. But in an environment where oil prices range between $40 and $55 per barrel, North American short-cycle plays will remain the growth engine for the oil-field services industry. Investors might want to consider nibbling on select US-focused service names while keeping some powder dry in case oil prices swoon once again. 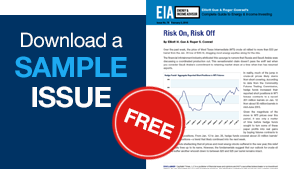 We view this issue as a guide to the oil-field services landscape that will help you to target future opportunities, as opposed to a call to back up the truck. With some oil-field service names trading at levels that have priced in a recovery, staying disciplined and focusing on valuation is critical.